WALLTITE® can be applied directly onto a solid masonry wall, between 90mm or 140mm timber studs, without the need for traditional adhesion promoters or mechanical fixings. Mechanical and electrical services can be fixed between the foam and the plasterboard. WALLTITE® guarantees additional support and stability for the whole of the timber frame construction. The resulting continuous insulation and air barrier system will provide a cleaner, healthier more comfortable environment for any “hard to treat” home situation. 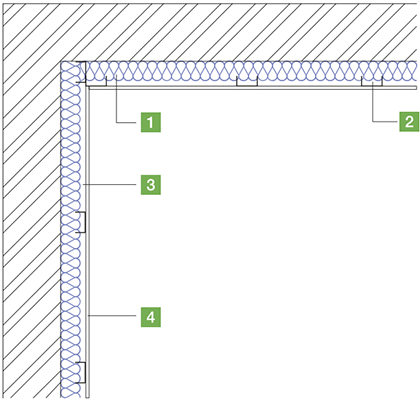 At corners of internal and external walls to rooms, set frame to external wall back from corner a minimum of 25mm and set batten to line with vapour check wall boarding to receive board end to internal wall. WALLTITE® can be applied directly onto a solid masonry wall, around the frame/channel brackets, without the need for traditional adhesion promoters or mechanical fixings. 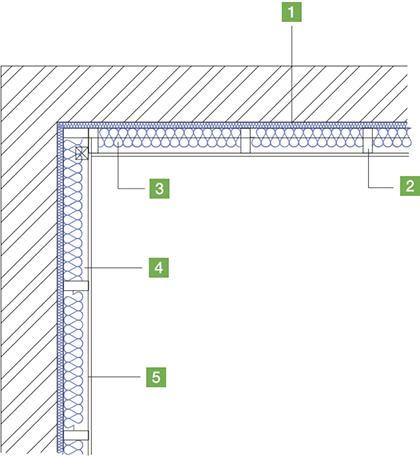 This method greatly reduces repeating thermal bridges through the insulation caused by either timber studs or metal frames. The resulting continuous insulation and air barrier system will provide a permanent solution for any ‘hard to treat’ solid wall situation.